Divided into two parts, Alcohol and Emerging Markets begins with a series of case studies that assess alcohol issues in four regions - Asia, Central and Eastern Europe, Latin America, and Sub-Saharan Africa - and four countries - China, India, Mexico, and Russia. Issues such as past and current public policy developments, prevention programs, and treatment of alcohol related disorders are addressed as well as the health consequences of alcohol use and abuse. In the second part, the contributors consider the issues relevant to the entire geographical region covered by the book. 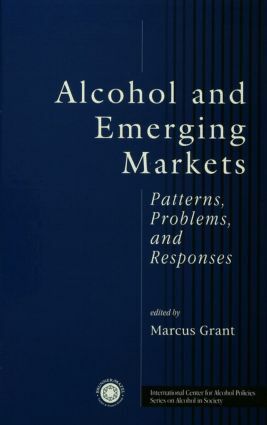 The book also includes a chapter that examines the role of the industry in emerging markets and suggests a set of guidelines that address alcohol misuse issues. "The second volume in the International Centre for Alcohol Policies series on Alcohol in Society explores in a unique way how a balance may be achieved between public health and commerce; giving a good indication how in practice different disciplines like governments, scientists, scholars and public health experts, non-governmental groups and bodies, as well as the beverage alcohol industry, all need to have a place at the table." --Alcohol & Alcoholism, Vol. 35, No. 4, 2000." Drinking Patterns and Policy Development. Part One: Contemporary Trends Sub-Saharan Africa. Asia: An Overview. South East Asia. China. India. Central and Eastern Europe. Russia. Latin America. Mexico. Part Two: Encouraging Better Practice. Beverage Alcohol in Developing Regions: An Anthropological and Epidemiological Perspective on Public Health Issues. Economic Issues and the Emerging Global Alcohol Market. Alcohol in Emerging Markets: Identifying the Most Appropriate Role for the Alcohol Beverage Industry. Afterword.